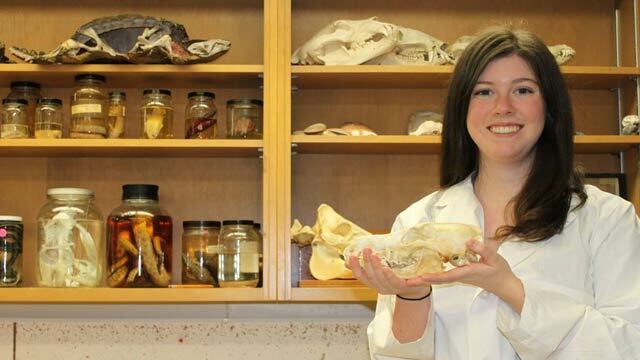 Biology at Brandon University is about much more than the scientific study of animals, plants and microbes. First-year introduces the diversity of life on the planet and explains how genes and cells function. Second-year courses further explore diversity and fundamental biological and ecological processes, leading to third- and fourth-year courses with greater specialization. Students can pursue degrees in two different streams: Biology or Biomedical. The Biomedical stream is designed for Biology students to gain successful entry into health professional programs. Students often choose this stream when they plan to apply for programs in dentistry, medicine, optometry, physiotherapy, genetic counseling, veterinary medicine, or as a physician assistant. The success rate is high for Biology students applying to professional programs, particularly medicine. There are two reasons for this success. First, our course curriculum prepares students for admission exams such as MCAT. Second, the Biology Department and the Office of Rural and Northern Health run jointly an outreach program of workshops to support professional entry. The Biology stream offers courses to provide a broad base of training and prepares outstanding students for a range of graduate programs. Undergraduate research is encouraged in the Biology stream and is especially valuable in preparation of students for graduate school. We have a proud record of our 4-year majors (both streams) being accepted into Masters programs across Canada and internationally. Additionally, our students have found success in careers in agriculture, wildlife and life science careers across Canada. There are many opportunities for hands-on experiences for undergraduate students in the biology program. Students can engage in research activities with professors through research topics courses and the honours thesis option, and when their undergraduate program is complete our students have the option of BU’s new M.Sc. (Environmental & Life Sciences) working on a research project with a Biology professor. Biology is one of the most research-productive departments at Brandon University, housing professors that have successfully pursued Federal and Provincial government and private sector funding, resulting in tangible research outcomes for our students while at the same time raising Brandon University’s national and international profile. The Department has been very successful in obtaining funds from the Canada Foundation for Innovation (CFI) and the Manitoba Research and Innovation Fund (MRIF). These funds were used to create state-of-the-art research facilities that provide outstanding training environments for undergraduates and graduate students wishing to pursue research. Outdoor field-work experiences that feature in our ecology and biodiversity courses capitalize on local and regional habitats. Every Biology Major and Minor is assigned a Faculty advisor. This advisor guides and mentors our students through our program for their entire program of study. This coupled with small class sizes eases the transition into our program and enhances student success. The biology program is structured around core courses which are required for all students planning to major in Biology. These courses are: Cells, Genetics and Evolution; Biodiversity, Functions and Interactions; Principles of Genetics; General Ecology; Animal Diversity and/or Plant Biology; and Evolution. Students select additional courses (e.g., Plant Physiology, Applied Biomedical Science, Conservation Biology) based on their interests in one of the available streams.